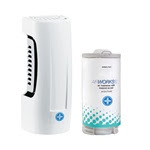 The Airworks 60 Air Care System from Hospeco is one of the best automatic air dispensers for your buildings and restrooms. No fooling with batteries as they are built into the refill cartridges. Your janitors will love these since they last longer than traditional 30 day air care systems and are easy to change.